What happens if White cuts? Is there some reason the pros invariably answer (at ) as White in this diagram? In Andrew's diagram the good style play for Black is b rather than anything else, in the upper left. But it is often better to do nothing at all in an unsettled position. To try to answer Andrew's question (as corrected by me): this is an orthodox position, and White at now is or was the main line. Various fighting options have been tried. The main alternative is to play one line higher. They have mostly stopped doing that, as one can find by searching a database. This is the usual situation of seeing stuff and wondering if it can be made to yield some reasons. If you use the large knight's move enclosure after the approach to 4-4, the 3-3 invasion tends to come very soon. Here White would end up with strength mainly facing up the left side - a difference from the small knight's move enclosure, which yields better influence along the bottom. You have to look at least that deep. Hmmm. I spoke too soon. looks too passive, since White has a ladder to capture . But the exchange in the top left corner probably balances out. I still think that the cut is playable. Charles Matthews Sure, the cut is playable - made in a number of pro games. Andre Engels: From my collection: Position occurs 193 times, amongst which white plays some kind of answer down the upper left 121 times, pincered the black stone 20 times, plays around the middle of the left side 13 times and cuts 4 times. If we extend the search by disregarding the right half of the board, the numbers get to 405 occurences, with 323 extensions in the upper left, 45 pincers, 23 plays around the middle of the left side, 10 cuts and 4 times where white plays on the right and black gets the next move in this area. Bill: Thinking of as a probe makes sense, but there are other factors. First, it is likely that is a bit larger than a connection in the bottom left. It has been known for a long time that continuing this joseki is inferior for Black too early in the game. Second, and more telling, the relation of to the nirensei on the right is very significant strategically. This relationship is , IMO, more important than its role as a probe for the play in the bottom left. 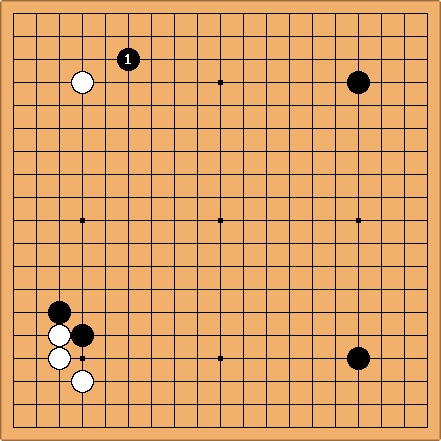 Black has prevented a White enclosure in the bottom left with sente. Now, is the natural strategic extension of the nirensei. In this I am influenced by the recent writings of Go Seigen, in which he recommends leaving other joseki in an early stage to make this kakari.